This Amish Flat Arm Glider is just what you need to sit and relax in supreme comfort. This Amish Glider has the rocking motion that you come to expect from a Glider and can also swivel in any direction you choose. 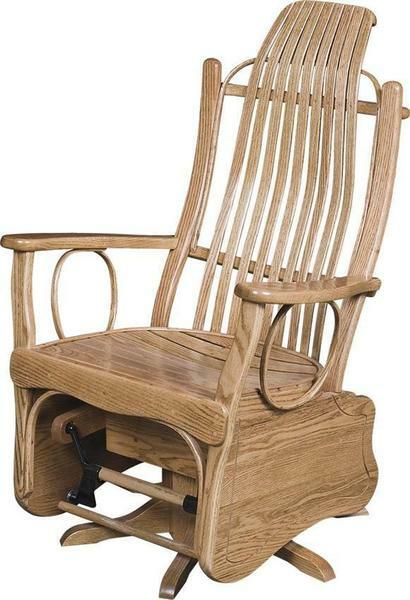 This Amish Flat Arm Glider is handcrafted by the Amish using your choice of either Oak, Cherry, or Brown Maple Wood. With multiple stain selections to choose from as well, you'll be able to customize your built to order Amish Flat Arm Swivel Glider just the way you like. If you have any questions or concerns, please call and speak to one of our Amish Furniture specialists at 1-866-272-6773. This Amish Beaver Valley Flat Arm Swivel Glider usually ships within 5-7 weeks.